The former praetor Decimus Junius Silanus is punished by his father for maladministration during his tenure as governor of Macedonia (ca. 140 BCE). 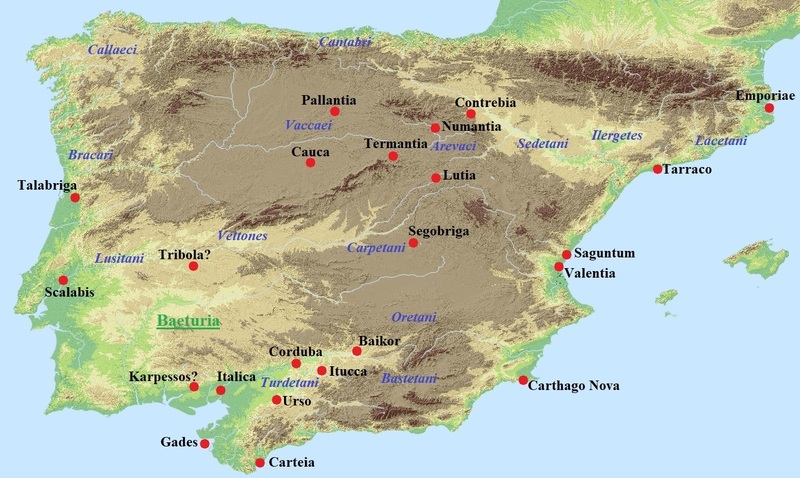 During the years discussed here, the Romans were still embroiled in wars against the Lusitanians and Celtiberian tribes in Spain. 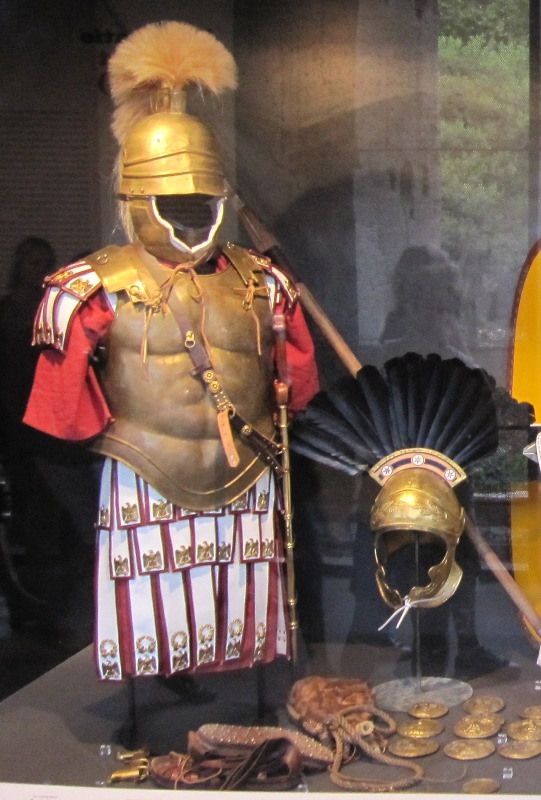 Thousands of Roman and Italian soldiers served in the peninsula and fought against fierce opponents. Conditions were harsh and results mixed. The war against Viriathus and the Lusitanians continued with a fresh Roman commander, the consul of 142 BCE, Quintus Fabius Maximus Servilianus. He was the brother of the general who had led the war in this part of Spain in previous years (see 145-143 BCE). The consul had brought a newly recruited army with him from Italy, which Appianus says comprised 18.000 infantry and 1.600 cavalry. Later a few battle elephants provided by King Micipsa of Numidia would be added to the army. The consul’s first confrontation with Viriathus proved to be a success. The latter wanted to test his new opponent and attacked him in the vicinity of Itucca with a much smaller force of some 6.000 men. The Lusitanians tried to intimidate their relatively green opponents with their war cries and terrifying appearance, but the Romans held their ground well and easily repelled the attack. When 10 elephants and 300 Numidian horsemen had arrived, the consul took the offensive to the Lusitanians. Servilianus defeated Viriathus, but then his men quickly discovered that the Lusitanians had only feigned their retreat. Suddenly they fell upon their pursuers, killed many of them and drove the rest back to their camp. The Lusitanians could have taken the camp as well, had not some brave Romans prevented this and nightfall put an end to the fighting. The Roman army had been saved, but constant harassing by Viriathus and his light cavalry forced it to withdraw back to Itucca anyway. Viriathus was always hot on Servilianus’ tail, but only returned to Lusitania because his men had run out of provisions. Undeterred, Servilianus launched a new offensive in the spring of 141 BCE. The proconsul invaded Baeturia, captured and pillaged several towns loyal to Viriathus and then swung into Lusitania itself. There he was first harassed by a large band of brigands – the difference between a warrior, a rebel and a brigand was negligible -, but after dealing with these men, he captured several more towns previously controlled by Viriathus. Some 10.000 Lusitanians were captured. Most of them were sold as slaves, but 500 of the leading men were decapitated to set an example. Servilianus’ methods were brutal, but they did seem to work. The Romans were now much closer to winning the war against the Lusitanians. Unfortunately for Servilianus, things then went terribly wrong. While besieging a town called Erisana, his working parties were suddenly attacked by Viriathus, who had managed to sneak into the town at night. A pitched battle was then fought close to Erisana, in which the Roman army was completely defeated. The Lusitanians drove the survivors to rocky terrain from which they could not escape. Viriathus could easily have slaughtered them all there, but instead decided to offer Servilianus a peace treaty. What the Lusitanian leader wanted was recognition of his position. Servilianus had no option but to agree and the treaty was sent to Rome, where it was ratified by the Senate. Viriathus was officially recognised as a ‘friend of the Roman people’. But this was not how the Romans liked their wars to end. In 140 BCE, Servilianus was relieved by the consul of 141 BCE, Gnaeus Servilius Caepio, who happened to be his brother by blood. Caepio broke the treaty and pursued Viriathus. The latter was loath to risk battle, as his army was much smaller. In the end the Lusitanian leader decided to negotiate. The Lusitanian war now entered its final phase. There was, however, still a war going on in Nearer Spain. Probably in 141 BCE, the successful commander Quintus Caecilius Metellus Macedonicus, was replaced by the other consul of 141 BCE, Caepio’s colleague Quintus Pompeius. According to Appianus, Pompeius’ army was huge, comprising 30.000 infantry and 2.000 cavalry. Many of the Arevaci had already been subdued by Metellus, but the towns of Numantia and Termantia were still in rebel hands. Pompeius was a ‘new man’ and eager to prove himself, but his attack against Numantia was a complete failure. The Numantines had just 8.000-10.000 warriors at their disposal, but these were very skilled and extremely motivated. Unable to make any headway at Numantia, Pompeius decided to attack Termantia instead. Here he was repulsed as well. The small town of Malia proved to be an easier target, as it was betrayed to him by its citizens. But Malia was hardly the prize that the consul had hoped for. It was probably late in the year when Pompeius returned to Numantia. The town was extremely well protected by the river Durius (now the Douro) and several ravines and forests. Pompeius tried to divert the course the river, but his working parties were constantly attacked by the Numantines. Frequent sallies made foraging very difficult and the Romans spent most of their time in camp. To add insult to injury, his veterans were soon replaced by green soldiers, freshly recruited and not used to the harsh conditions in Spain. These men suffered severely during the bitter cold winter and many fell ill as well. Probably in early 140 BCE, the Numantines killed a great number of Roman soldiers and their officers in an ambush. Pompeius knew that he could not win this conflict by force and he also realised that he would soon be relieved by a successor. The Roman commander therefore decided to start secret negotiations. The Numantines were certainly prepared to end the war. They had suffered too, had lost many of their warriors and were running out of food as well. 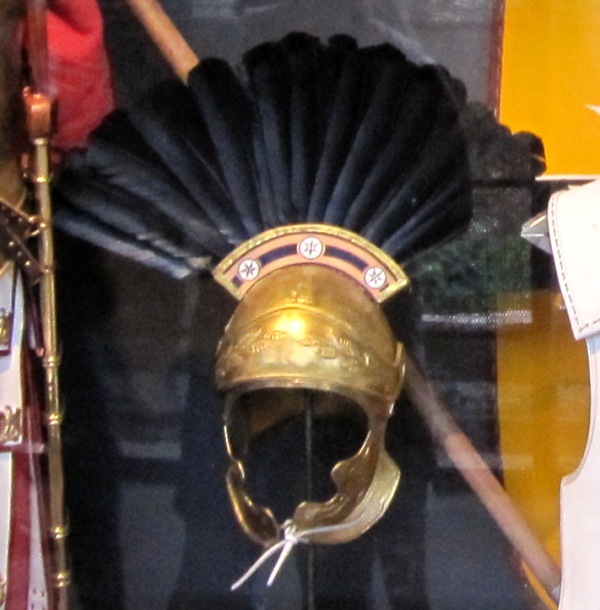 Pompeius advised his opponents to publicly offer a deditio, an unconditional surrender, adding that this was the only type of surrender that the Roman Republic could accept. Privately, however, he offered them much more generous conditions. In the end an agreement was reached and the Numantines gave hostages, surrendered deserters and paid a fine. The war was now over. Or was it? In 142 BCE, Scipio Aemilianus was elected censor, with Lucius Mummius Achaicus serving as his plebeian counterpart. Few details of their activities have been preserved. We know, however, that Scipio ordered a knight (eques) named Claudius Asellus to sell his public horse, and that the man tried to take revenge on the censor by prosecuting him after he had been elected people’s tribune. It seems unlikely the trial was successful. The censors completed the Pons Aemilius across the Tiber as well, adding the arches (see 179 BCE). They registered a total of 328.442 citizens. Scipio’s great friend Gaius Laelius was elected consul in 140 BCE. One of his most memorable acts was an attempt to instigate land reforms. Rome’s conquest of Italy had ensured that much of the land in the peninsula was owned by the state, the res publica. 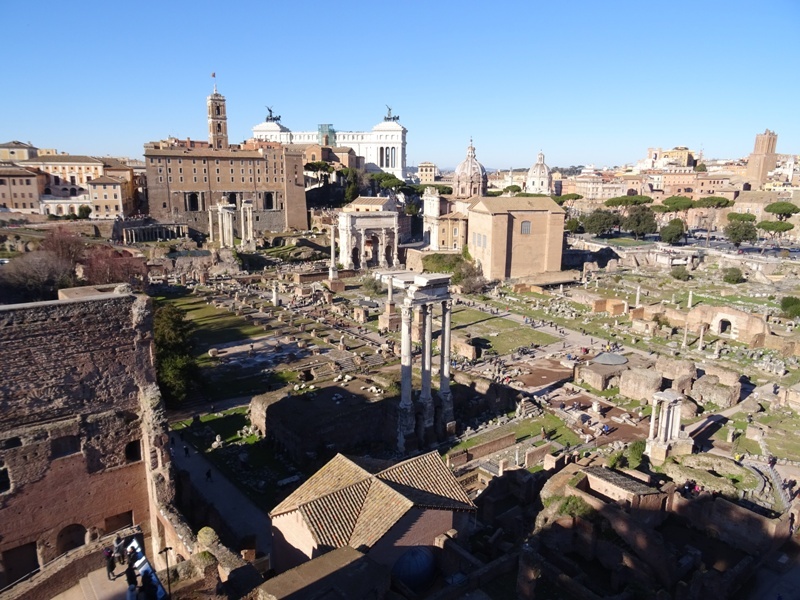 It was so-called ager publicus and basically every Roman citizen could lease a part of it in return for paying a small sum. Although a law prohibiting citizens to hold more than 500 iugera of public land had been passed almost two centuries previously, this law – the Lex Licinia Sextia – was often ignored or circumvented by rich Romans and presumably did not apply to non-Roman Italians. These men annexed huge swathes of the land and turned these into enormous agricultural estates called latifundia, which were generally worked by slaves. Laelius proposed a bill for a lex agraria to redress this situation, but withdrew it in the face of stiff opposition from conservative senators and other members of the nobility. Plutarchus claims that this was how Laelius acquired his cognomen of Sapiens, ‘the wise’. Just a few years later, a tribune named Tiberius Gracchus would not be so ‘wise’. Probably also in 140 BCE, inhabitants of the newly created province of Macedonia levelled complaints against their governor, the praetor Decimus Junius Silanus. The man was accused of maladministration, including taking bribes and looting the province under his command. The case could very have been brought before the quaestio perpetua de repetundis, the permanent extortion court set up in 149 BCE. However, when the Senate debated the issue, the governor’s father asked the senators to turn his son (by adoption) over to him for investigation and, if necessary, punishment. This Titus Manlius Torquatus was a former consul, and his authority ensured that he got what he wanted. After declaring his son guilty, Torquatus sent the man into exile. Silanus, however, was unable to bear the shame and committed suicide by hanging himself. Livius relates that Torquatus did not even attend his son’s funeral. King Antiochos VI Dionysos (photo: Uploadalt/British Museum, CC BY-SA 3.0 license). Meanwhile, the once proud Seleucid Empire had been torn to shreds. In the 140s, the Parthians under their formidable king Mithridates had overrun all of the eastern satrapies. Media, Babylonia and Persia were now all part of the Parthian Empire. The Parthian victories were made all the more easy by the fact that two men claimed the Seleucid throne. 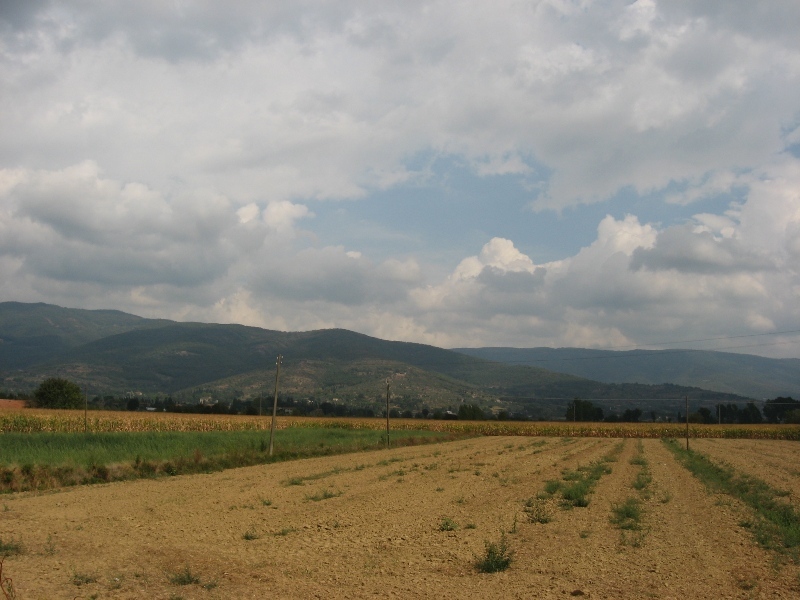 Diodotos Tryphon controlled the capital of Antiocheia and acted as a regent for the boy-king Antiochos VI Dionysos. His opponent was the legitimate (or semi-legitimate, as he had usurped the throne himself) king Demetrios II Nikator. Tryphon had captured the Jewish High Priest Jonatan in 143 BCE and tried to ransom him to his brother Simon. Simon paid the required sum, but then in 142 BCE, Tryphon had Jonatan murdered anyway. Obviously this heinous act drove Simon, the new Maccabean leader, into the arms of Demetrios. The latter needed a strong ally and was willing to make concessions. That same year, a treaty was made between the two. Simon became the new High Priest and sent a delegation to Italy to confirm the treaty of friendship with the Romans. He got a friendly reply from the consul “Lucius”, no doubt the consul of 142 BCE, Lucius Caecilius Metellus Calvus. In 141 BCE, Simon managed to finally expel the Seleucid garrison from the Tower of David, the citadel of Jerusalem. The Judea of the Maccabees was now de facto independent, and from now on, we generally refer to the Maccabees as Hasmoneans instead. In the meantime, Diodotos Tryphon had rid himself of Antiochos VI. Livius’ claims the boy had been killed during an operation by his physicians, who had been bribed by his regent. In any case, Tryphon was now king in his own right. His luck increased when he heard what had happened to his rival Demetrios. In 140 BCE, the latter had taken his army on a campaign against the Parthians and had invaded Mesopotamia. The offensive ended in disaster a year later when the Seleucid army was destroyed by a Parthian force and Demetrios was taken prisoner. The struggle against Tryphon was continued by Demetrios’ brother Antiochos VII Sidetes, who also married his wife Cleopatra Thea. It was Cleopatra’s third marriage. The rest of the story of the Seleucid Empire can be told in a few lines. This was no longer an empire, but a sorry old man on his way to the exit. In 138 BCE, Antiochos VII Sidetes expelled Tryphon from Antiocheia and had him killed later that year. Probably in 134 BCE, the king tried to win back Judea and laid siege to Jerusalem. By this time, Simon the High Priest was dead (murdered) and Jerusalem was defended by his son John Hyrcanus, the new Hasmonean leader. John seems to have bought his opponent off, and was allowed to continue his rule as a vassal of Antiochos. This situation did not last long, as Antiochos marched off to the east to fight the Parthians and win back the lost satrapies. The Parthian king Mithridates had died by this time and had been succeeded by his son Phraates. The latter decided to release Demetrios II Nikator, now in captivity for some 10 years, hoping that it would cause the two brothers to go and fight among themselves. But things worked out even better. In 129 BCE, Antiochos VII Sidetes was defeated and killed in the vicinity of Ecbatana, Media. Antiochios VII can be considered the last competent Seleucid king. He was succeeded by an impressive string of nonentities. Even his brother Demetrios managed to win back his throne for a few years before he was killed in 125 BCE. There is no need to discuss the next sixty years. Suffice to say that in 64 BCE, the Roman general Gnaeus Pompeius Magnus put the once great empire out of its misery by deposing its last king, Antiochos XIII Asiaticus, and making Syria a province of the Roman Empire. While the Seleucid Empire was going down the drain, the de facto Hasmonean kingdom began a period of expansion. John Hyrcanus’ son Judas Aristoboulos (104-103 BCE) was the first to formally use the title of basileus or ‘king’. 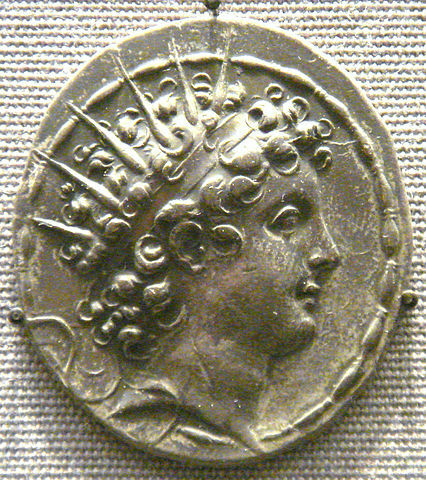 And it would be a dispute about the kingship that brought the aforementioned Pompeius to Judea a year after deposing the last Seleucid king. Plutarchus, The Life of Tiberius Gracchus 8.4. Quintus Fabius Maximus Aemilianus and Quintus Fabius Maximus Servilianus had both been adopted into the ancient patrician gens Fabia. The story is mentioned by Aulus Gellius, Attic Nights, Book III.4. The Life of Tiberius Gracchus 8.4.